By now most, if not all, of you would have seen the leaked White Dwarf pages that went up on blogs all over the world this week. I resisted because, well, what would be the point? Especially as so many of my fellow Alliance members had gotten there first. It has, however, given me time to reflect on the prominence of the Dark Angels in the new edition and the slight shuffling on of the canon from the previous version. More over I’ve been thinking about the Dark Angels. It’s quite telling that we’re on the cusp of the 42 Millennium, the Golden Throne is failing, and the fate of the Imperium hangs in the balance and there is a sudden emphasis being placed on the 1st Legion. The Dark Angels have always been a mysterious bunch and all the evidence suggests it is because of the betrayal of half the Legion during the Heresy. And although they bear those scars with great shame, the true cause of their secrecy is the realisation that came with capturing Luther and his eventual confession. The great secret that the Dark Angels keep is, whereas the Space Wolves are the Emperor’s executioners, the Dark Angels are or will be the executioners of the Emperor. From broken lips Luther told his captures that the Emperor was a true immortal, a being destined to be reborn for all eternity and by keeping him trapped within a shattered physical form humanity was preventing his rebirth and with it their very salvation. This secret was the Dark Angels’ alone to bear and with their stoicism they would see it done. Cypher’s quest to kill the Emperor is a well established part of the background, his motivations supposedly sinister. And wherever the lost son of The Lion makes planet fall the Dark Angels descend to allegedly bring him to justice. It’s no surprise to see Divination as one of the Dark Angel psyker traits for 6th edition. In the resulting engagement Cypher makes his escape and with each new appearance he gets closer and closer to Terra. The assumption is that the Dark Angels are trying to stop Cypher but I propose that they are trying to help him by covering his tracks and sowing misdirection as on the surface the Dark Angels appear to be doing little more than thwarting heretics. But think about it, Cypher is from a time when the Emperor was not a God – a truth all Space Marines hold – and so often times Cypher is doing little more than opening the eyes of those he comes into contact with. The Imperial Creed demands action is taken. The Dark Angels prosecute the campaign as far as they need to then withdraw. His escape is assisted by the fundamental and intentional conflict within the chapter structure. Battle brothers don’t know the true extent of the Dark Angels’ role in things to come, whereas company captains are initiated into the Deathwing and so, to a point, do. They accept the grim task ahead of them with the redoubtable determination we’ve come to expect from the First Legion. As a result the Dark Angels hamper their own efforts to capture Cypher and further turn the wheels of destiny towards the inevitable death of the Emperor. This isn’t to say that the Dark Angels are heretics or traitors. Far from it. Arguably only the Dark Angels and the Space Wolves see things for that they really are and the grim roles they must play. The Dark Angels know that the Wolves will be set upon them once their work is done. And probably deepens the resentment that runs between the two Chapters. Especially as the Wolves know they were powerless to change anything as for the Dark Angels to succeed they must fail in their most basic duty. To keep the Emperor safe. The Dark Angels understand that by allowing the Emperor’s shattered mortal form to die he can be reborn and will signal for the Primarchs to return and herald a new age of reclamation. Although I suspect that it’ll be The Lion himself that ends his father’s life as he was always destined to carry a terrible burden. Indeed there’s every likelihood that he saw this possible future which is why the weight of the Legion was so heavy on his shoulders. Combined with my note about the Tau ostensibly being anti-Chaos weapons it all seems to point quite strongly that humanity is on the brink of either destruction or redemption but it’ll come at a terrible price and its survival may come at the cost of the Imperium itself. 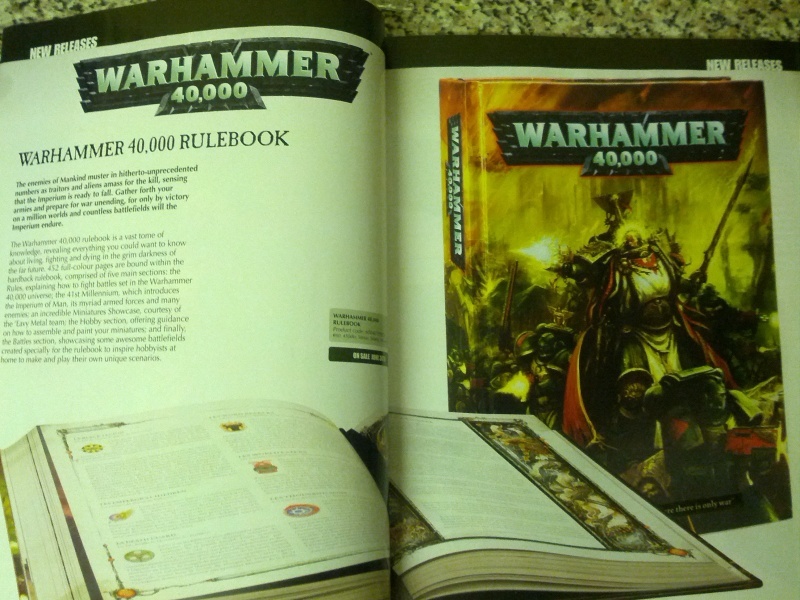 This is purely speculation but it’ll be interesting to see where the new Dark Angel codex will be taken and whether or not the rumoured ‘Warhammer 41,000’ will ever come out and how that follows on but I suspect a lot of questions will be answered in the coming months. That’s a pretty amazing conclusion… I like it! I just hope GW have that in mind. Would be awesome to see 41K, even if it’s only limited edition or something! After all, they can only have so many big things happen before the turn of the millennium! Rumour has it it’ll be available as a supplement. Permission to drool… I’m not all that keen on the models like I used to be (except for forgeworld), but I still love the fluff! Some interesting points from Mr Case. It is certainly a great take on what could happen. This leaves a lot to think about. Interesting speculations on the future of 40k from Phil over on the Shell Case. Suitably dark background for the angels and the wolves. I’m still unsure about ultras and Taus. The classical imperials and the Eastern Tau don’t seem natural bedfellows. They’re not but the Emperor commands and the Astartes obey. for any of us that have read ‘Rise of the Tau’ you will know this man here is correct in his assumptions. well done.